With the upcoming Unique Device Identification (UDI) requirements being implemented by the FDA in the US and the continuation of similar device identification requirements throughout the world, concerns over the potential effects of laser marking on metallic medical implants and devices have come to the forefront. Lucideon has extensive experience with the evaluation and testing of laser marked components and has been able to identify the causes of many failures related to laser marking. Laser marking of metallic components has been the healthcare industry standard for decades. When properly applied and treated, laser marks can have little or no effect on the metal substrate and have no impact on component performance. However, when improperly applied, significant damage can be done to the metal substrate and the fatigue life, fracture toughness, corrosion resistance and biocompatibility of the material can all be negatively affected. Lucideon with its team of metallurgical engineers, offers a full range of testing, evaluation and consulting services related to laser marking. The metallurgists at Lucideon have extensive experience with the effects of laser marking on all metal systems. Specifically, the effects on titanium medical implant and device surfaces with the possible creation of high oxygen content regions and the formation of the detrimental alpha stabilized zones akin to alpha case are well understood. The other common laser marking problem is associated with stainless steel and steel components such as surgical instruments. 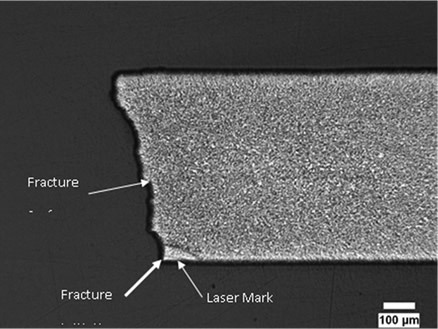 The formation of a brittle phase known as untempered martensite below the laser mark surface (typical image shown below) can cause premature fracture of the instrument. In both cases, as well as with other metal systems, the engineers at Lucideon can evaluate the extent of any laser marking problem and provide recommendations on how to mitigate issues associated with the laser marking system. Additionally, Lucideon can devise evaluation plans and test procedures to validate current laser marking procedures and ensure that product performance is not affected by said laser marks. Lucideon engineers can also work with designers on the proper location and sizing of laser marks to ensure minimal functional impact. Assessments are provided in the form of reports with all the imaging and analysis results necessary to characterize the quality of the laser mark on a particular component. SEM images, optical micrographs, and microindentation hardness test results are provided which will document the condition of the material in and around the laser mark. Corrosion tests and mechanical tests including fatigue and fracture toughness can also be applied to validate product performance. Most importantly, recommendations can be provided to ensure that the laser marking system and post treatments are properly applied to yield optimal product performance. Standard Test Method for Knoop and Vickers Hardness of Materials – ASTM E384.